In 1798 (Walker’s chart) Lisle & McPherson owned Lots 14 & 15 on the west sea coast of Essequibo (also known as the Arabian Coast). 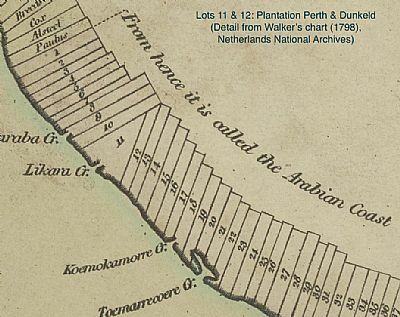 These Lots were known as Perth & Dunked by 1813 (Report of Titles to Land Commissioners for Essequibo, Appendix, xii), although they were sometimes referred to simply as Perth (London Gazette, 1814). In 1813 there were 110 slaves on the plantation, which grew cotton. In 1804 James, John and William McPherson, all of Essequibo, made donations to Perth Academy (James 21 guineas, John 10 guineas and William 10 guineas). John died before 1814 and in 1832 the plantation was owned by J & W Macpherson. The plantation was later abandoned (Kirke, Twenty Five years in British Guiana). In 1836 compensation of £6158 10s 1s [for the emancipation of 112 enslaved people on plantation Perth] was assigned by James and William McPherson to John Campbell snr & Co.